Frugal & Fabulous: Giveaway $50 Gift Card to The Limited! Giveaway $50 Gift Card to The Limited! The Limited is celebrating their 50th anniversary! To celebrate their golden anniversary, they are kicking-off a celebration with a special campaign to support Dress for Success, a nonprofit organization that offers professional apparel, a network of support and career development tools to women who are entering or re-entering the work force. The Limited is inviting its clients to share success stories, life lessons and great moments in their lives – whether personal or professional – with others who can learn from their wisdom. Want to share your story? Submissions are being accepted at thelimited.com/50th. The company will donate $1 to Dress for Success for every submission, up to $50,000. Additionally, The Limited is donating to Dress for Success 30% of the proceeds from a limited edition clutch purse and a commemorative bracelet that will debut this fall. Dress for Success is an international not-for-profit organization that promotes the economic independence of disadvantaged women by providing professional attire, a network of support and the career development tools to help women thrive in work and in life. Since starting operations in 1997, Dress for Success has expanded to more than 125 cities in 15 countries. To date, Dress for Success has helped more than 700,000 women work towards self-sufficiency. Visit www.dressforsuccess.org to learn more. 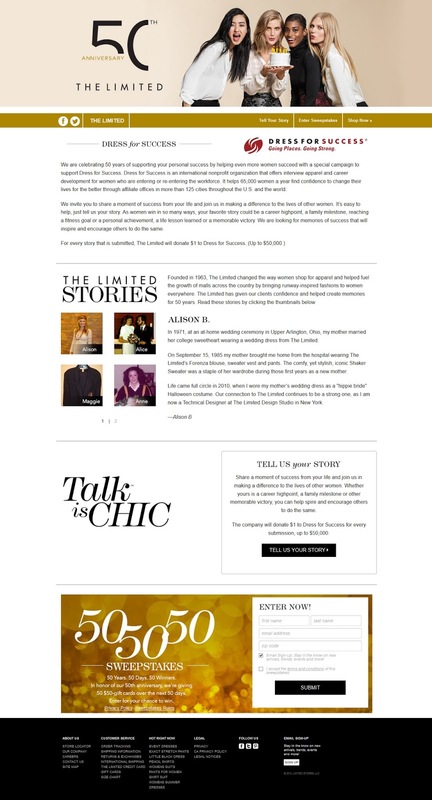 Our friends at The Limited are giving one Frugal & Fabulous reader a $50 Gift Card to The Limited! Use the Rafflecopter below to enter!